Fuel efficiency, economy and getting the most out of the vehicle is what Airflow Snorkels aim to achieve and yes, to go through that river crossing. Airflow has a range of cold air ram induction manifolds that will aim at increase the performance and efficiency of your 4WD. Airflow produces models that provide substantial ram and cold air induction effect and also models that provide ram effect only. Fuel efficiency, economy and getting the most out of the vehicle is what Airflow Snorkels aim to achieve and yes, to go through that river crossing. 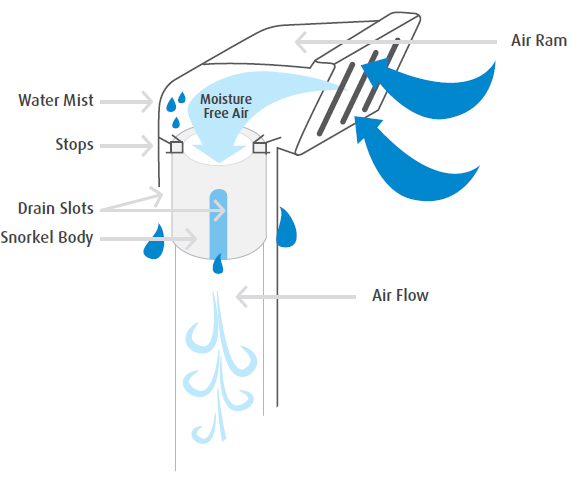 The Airflow Cold Air Induction System (ACAIS) harvests fresh air at roof level where it is the least disturbed. This air contains less contaminant and is cooler than air absorbed from the engine bay. When the air is cooler, it contains more oxygen. Consequently, the availability of cooler air inflow results potentially increasing power and torque. Cyclone air ram operationAir passing into an air ram creates a cyclonic effect which separates out the majority of the contaminants. As the air swirls, the heavier air particles move out where they hit the vertical ribs which slow the particles down. Then with the action of the air, gravity and the ram- effect the particles are pushed out the four slots in the air ram. The finer particles are removed by the vehicle air filter. Not all air rams are equal in performance. In general air rams need an open face preferably without a screen (which deflects airflow). Approximately 30% of the incoming airflow (above 25kph) is used in the separation process. A vertical cylinder section is incorporated for the cyclone separation to occur, with the aid of gravity and the air flow hitting against the separator ribs to separate the foreign material out. The minimum air required for any snorkel to operate is 1.4 time original inlet. (Less than this ratio and there will be insufficient cyclone action to separate the contaminants out effectively). This is a ratio of inlet velocity and mass airflow to outlet. In general terms if this ratio is not adopted engine will not have the minimum amount of air to the engine required for operation as it was designed. Not all snorkel makers meet the 1.4:1 standard required. The size refers to the inlet size of the snorkel body. Not the size of the air ram. The Small 3.” Airflow Air Rams (parabolic type air ram) Has a ratio of 3.5 to 1 induction capability. This can potentially add improvements to performance, economy, emissions and engine longevity. Other types of induction into the snorkel induction tube / manifold. Where the intake is moulded into the body of the snorkel (generally for design considerations), this provides limited separation of the air. Some cases where the snorkel intake is perpendicular to the direction of travel. This will cause a net vacuum at certain speeds. Incorrect design of the air ram can cause excessive induction noise, lack of separation, air blocking by vortex of the air at various speeds. This air blocking will limit airflow. This is a common occurrence where the design / look is put above the functionality of the air ram. Now the air has gone through the air ram and the heavy particles have been removed The air is traveling in a straight line and is slowing down as it comes into a larger volume area (in the case of cold air induction models). This will cut down the swirling effect caused by the air ram. This in turn reduces the friction loss. In the case of a non-induction tube type, air passes down to the outlet, where it is directed, with under bonnet tubing and ducting, into the air box. This will still increase efficiency and performance, but not to the extent of a cold air induction type. Many types of snorkel have bodies, which are restrictive to airflow due to shape, volume and placement of the outlet. Part of the incoming air is used to separate out the heavy particles in the air ram. Example dirt, insects and water. The participial separation provided by the air ram is a variable system. Therefore the prevailing way the vehicle is being driven and the driving conditions effect the separation rate. Pre-filter slow down the air. Therefore the air slows down, less separation occurs and therefore the pre filter collects more contaminants. There is not an absolute number (amount) of separation of contaminants. A comparison against type of inlet/air ram, shows the following across 5 set flow rates as an average. Type E cold air induction air ram 30% to 80%, using maximum 18 % of the available flow for separation. Any thing under >1. is creating a vacuum at the entry point. Any thing over < 1 is creating compressing at the entry point. In fact the Airflow Cold Air Induction range has 3.8 time the air. It can use as low as 3% and up to 15% of the available air for the separation process. Some other brands have a various cosmetic shapes that can impair the inward flows dramatically. They can use a very large percentage of the available air for the separation process. This will vary depending on the prevalent conditions and should only be used a guide.